A mental marvel from birth, who used his talents on stage as a boy, Philip Strange is now known as “The Phantom Ace of G-2″ by the Allies during WWI. “Horrors of war” takes on a whole new meaning when WWI erupts with paranormal activity: Flaming planes piloted by charred skeletons; Battleship crews that mysteriously vanish; Medieval knights falling from the sky; The spirit of the Red Baron himself haunting the frontlines! When World War I gets weird, only America’s own “Phantom Ace of G-2” has a ghost of a chance against the supernatural slaughter. Captain Philip Strange in his strangest cases yet from the pages of Flying Aces magazine! Take another trip through the imaginings of Donald E. Keyhoe, where the WWI war skies are filled with giant bats, invisible fire, and beautiful spies. And where America turns to its own unnatural secret weapon: Captain Philip Strange. A mental marvel from birth, he was so terrifyingly effective as the Allies’ top agent that the Germans were offering a king’s ransom for his death. 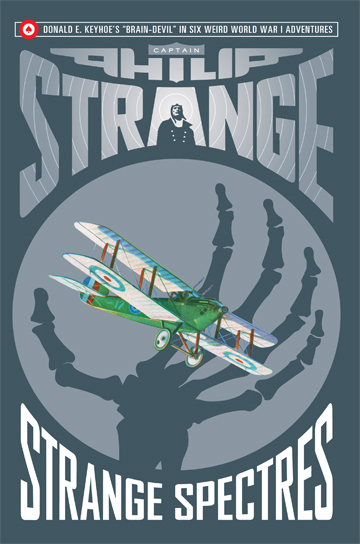 This fifth volume of weird WWI adventures collects six stories featuring Germany’s wildest attempts to win the war and Captain Philip Strange’s counter measures!